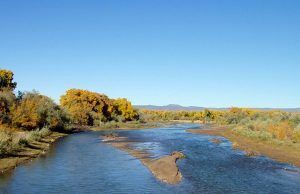 The Kewa Pueblo, formerly called the Santo Domingo Pueblo, is located on the east bank of the Rio Grande between Albuquerque and Santa Fe, New Mexico. Of the Keresan speaking family of tribes, all pueblo peoples are thought to have descended from the ancient Anasazi from whom they learned architecture, farming, pottery, and basketry. They trace their ancestry to an area around Chaco Canyon in New Mexico and Mesa Verde in Colorado. 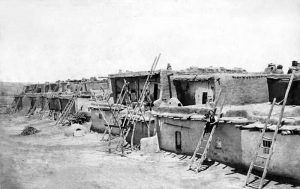 In the 1200s, the Keresan people abandoned their traditional canyon homelands in response to climatic and social upheavals and the people migrated to other areas creating a number of pueblos in New Mexico. The Santo Domingo people first lived in at least two villages called Gipuy, several miles north of the present location. After these sites were destroyed by flooding the people moved to the present location. Historically, the people spoke Keres, an eastern dialect of the Keresan languages. Like several other Pueblo peoples, they have a matrilineal kinship system, in which children are considered born into the mother’s family and clan, and inheritance and property pass through the maternal line. Once settled here, they devoted increasing amounts of time and attention to religion, arts, and crafts. 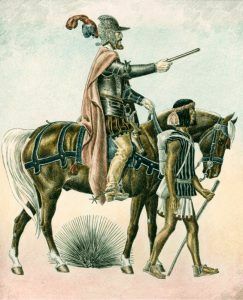 Upon the arrival of Spanish explorers and colonizers led by Juan de Oñate in the summer of 1598, many Pueblo people initially aligned themselves with the Spanish as means of combating Apache and Comanche raiders. The Spaniards would soon establish El Camino Real de Tierra Adentro (Royal Road) along the old Indian trails. By 1610, the Pueblo was a headquarters in the Spanish colonial mission system. The first church was built in 1607. Because the alliance failed to stop the raiding and the Spanish proved oppressive, Santo Domingo became a staging area for the Pueblo Revolt of 1680 which forced the Spaniards out the region. During the revolt, the people of the Pueblo killed three priests and burned and demolished the church. In 1692, however, the Spanish army, under Diego de Vargas, reconquered New Mexico and recolonized the formerly-abandoned pueblos and missions. Fray Antonio Zamora built a new church at his own expense in the mid-1700s. At this time the pueblo had two churches side-by-side facing south with the older one primarily used for burials. Farming on the Rio Grande had the advantage of a year-round water supply, but flooding was one consequence of living so close to the river. Major floods from the Rio Grande occurred in 1780, 1823, and 1830 destroying parts of the pueblo. The people of Santo Domingo built levees to keep the water away, but eventually, the community was forced to remove the church doors and carry out the paintings, statues, and anything that could be moved from the buildings. The floodwaters in June 1886 destroyed the church as well as the cemetery, leaving a steep bank where the building had been. 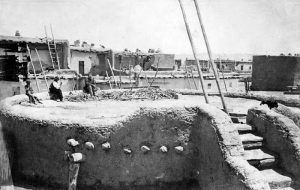 The people were then required to build a new pueblo which was originally constructed around a central plaza with long blocks of adobe houses along a wide central street. Builders incorporated surviving structures into the new plan and extended the pueblo to the east. Two large kivas (circular rooms used for religious purposes) are within the pueblo. The pueblo was without a church for 10 years. The new church constructed after the flood that destroyed the old adobe mission was built to resemble the previous church in style and construction. Agriculture has long been a central part of Pueblo life and farming helped to shape the local culture as it was closely tied to their religious belief systems. Believing that balance should be strived for in all things, ceremonies are an integral part of the culture. Indian kachina dances have long held great importance for the people in an effort to achieve this balance and help produce crops. These dances include singing, chanting, and costumed participants. The meaning behind these ceremonies has always been sacred and in the past, anyone suspected of revealing information about the ceremonialism, if not cleared, would be severely punished and sometimes executed. However, some parts of these dances are open to the public today. In 1880-1881 the Atchison, Topeka, and Santa Fe Railroad was built through the area ending the traffic on the Camino Real and changing the lifeways of the Pueblo people. 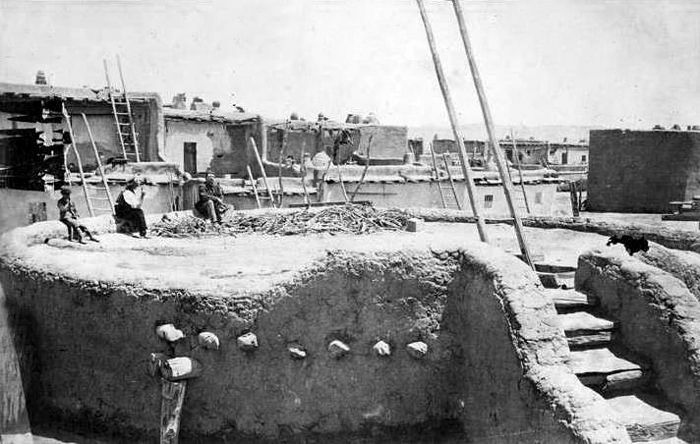 A railroad station was built at the pueblo and railroad boosters and entrepreneurs promoted the Pueblo people and their crafts to 19th-century tourists. 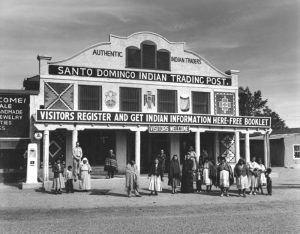 Many automobile tourists visited Santo Domingo Pueblo in the early 20th century and in 1922, the Seligman family constructed an adobe trading post adjacent to the Santa Fe Railroad. The two-story building built in the Mission Revival style was built just to the north of an older trading post that dated back to 1880. The Seligmans used this older structure as a warehouse. A small stucco residence was attached to the south of the warehouse. 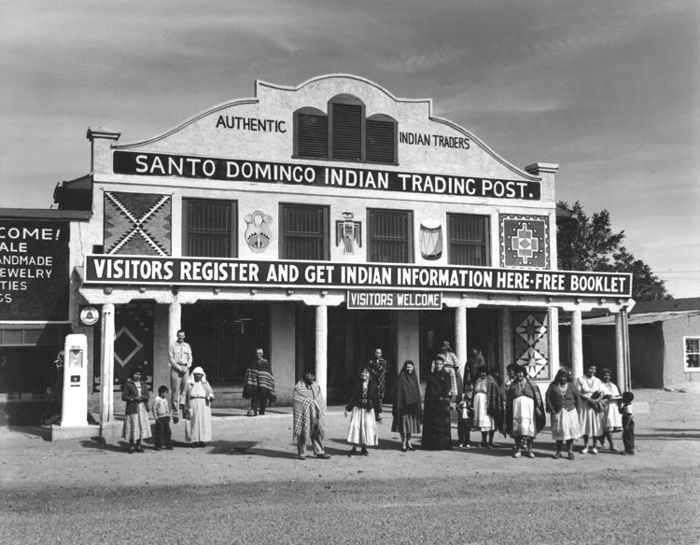 Colorful signs painted on the building proclaimed the Trading Post as “The Most Interesting Spot in the Old West” and “Where Real Indians Trade.” The trading post not only provided souvenirs for the travelers along the road, it also served as an important source of foodstuffs and finished goods for the locals. Just four years after the trading post was established, the pre-1937 alignment of Route 66 came through the pueblo in 1926. Along the highway, roadside stands were set up to sell items to tourists including crafts, pottery, and turquoise jewelry.